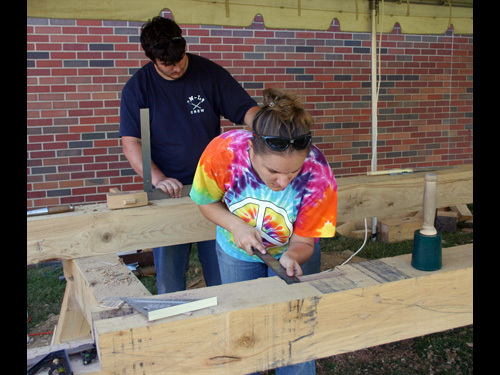 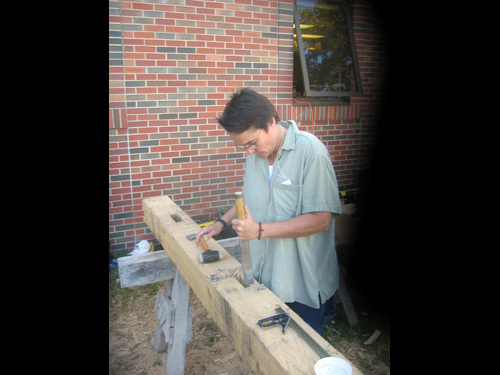 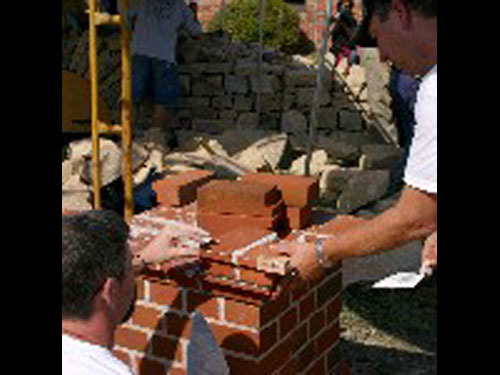 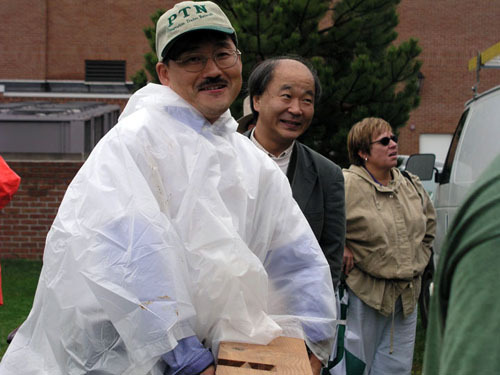 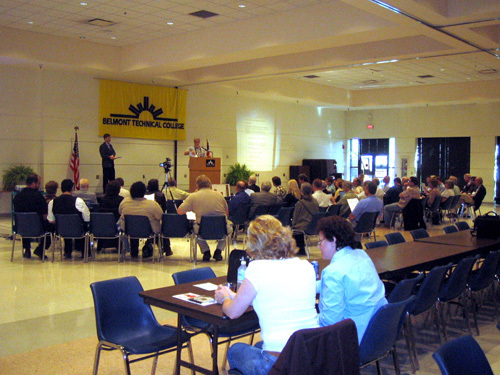 Belmont Technical College and Ohio University Eastern hosted the 9th annual International Preservation Trades Workshop, in St. Clairsville, Ohio. 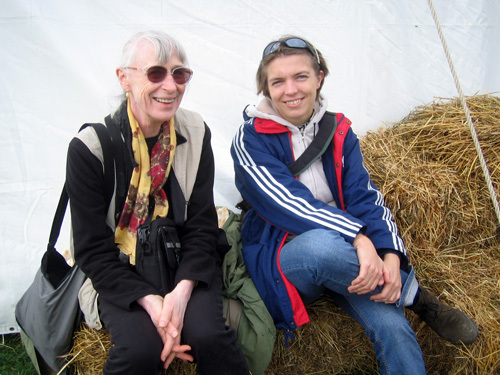 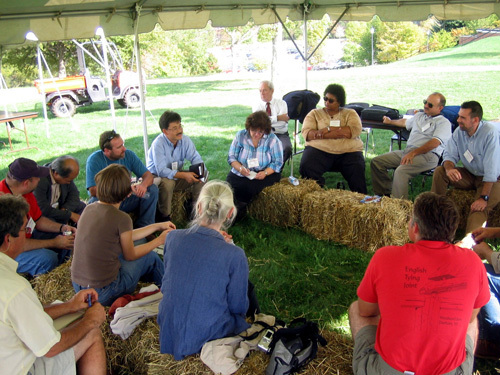 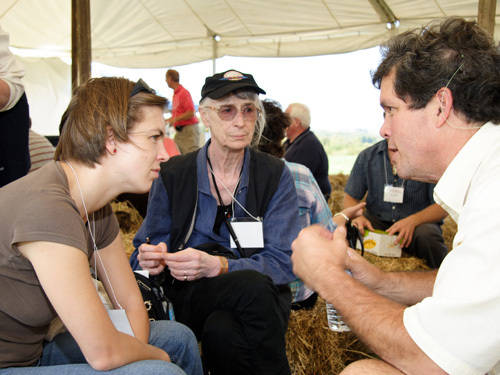 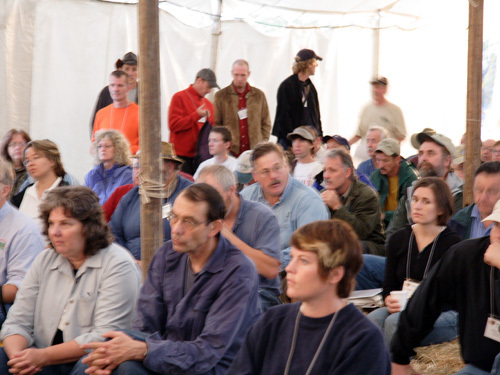 Demonstrators and participants from North America, England, Ireland, Scotland, France, Germany, Poland, Sweden and Japan made this a truly international gathering, building both tangible and intangible bridges to international communication and exchange. 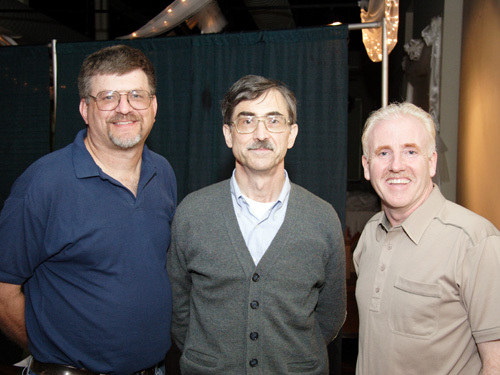 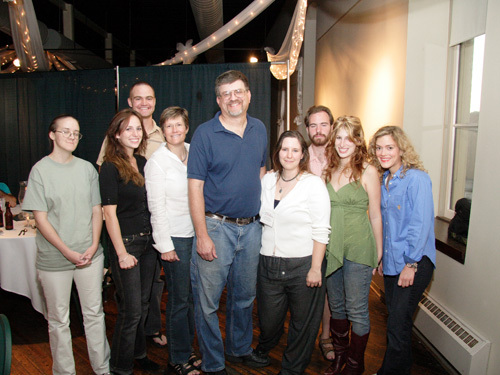 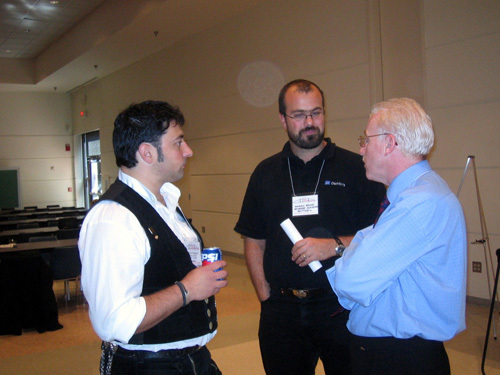 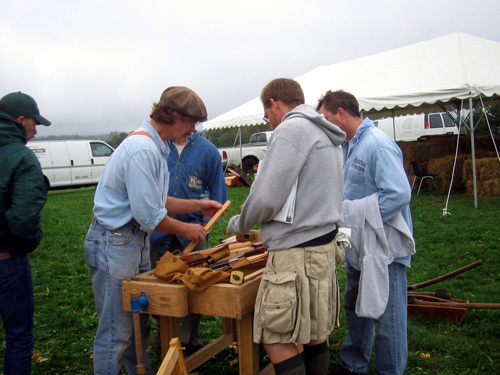 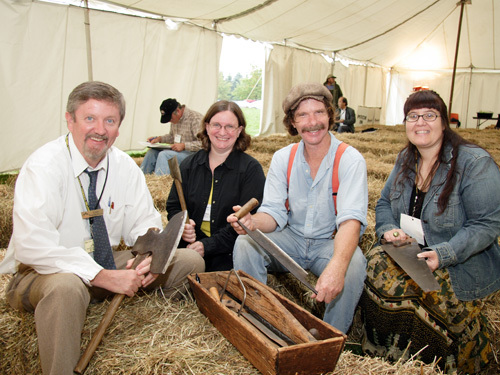 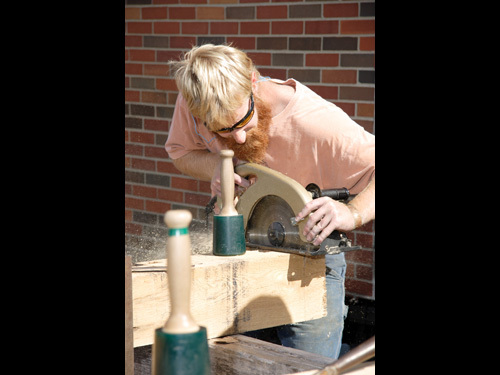 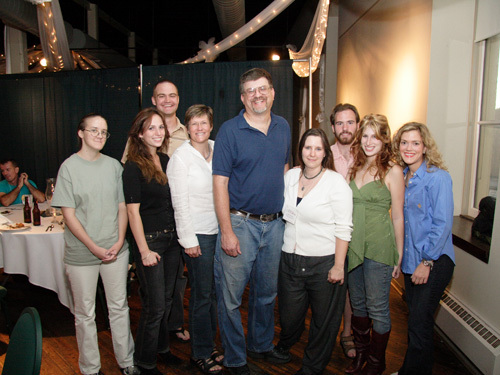 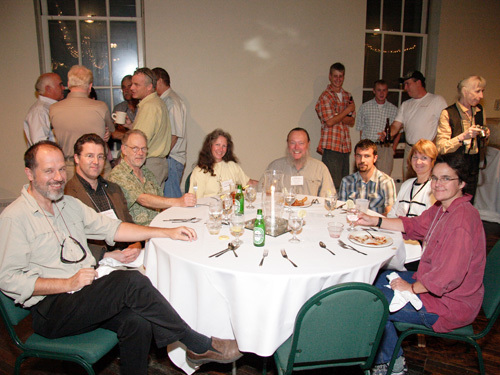 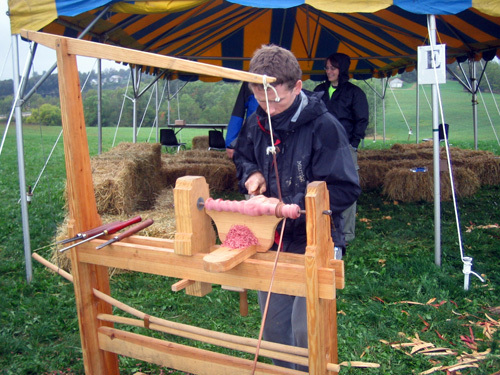 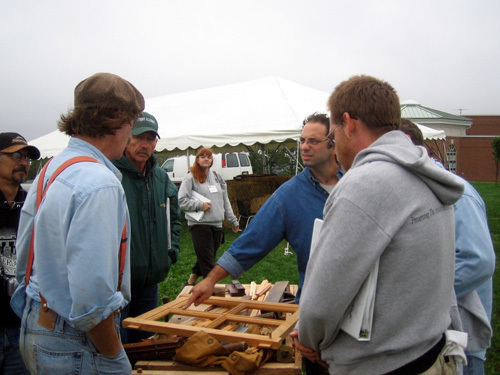 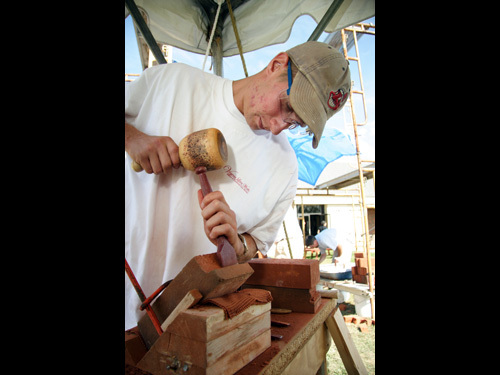 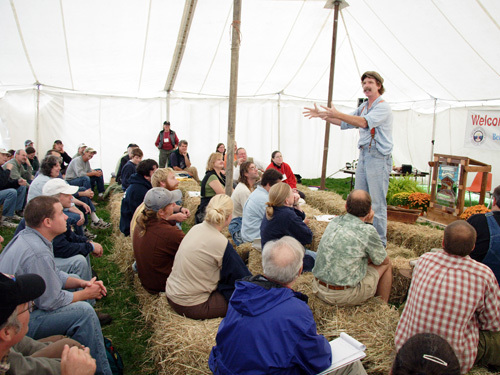 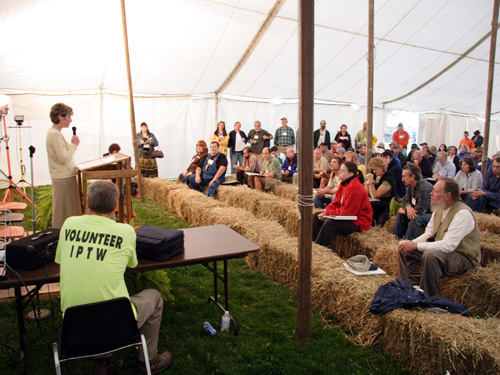 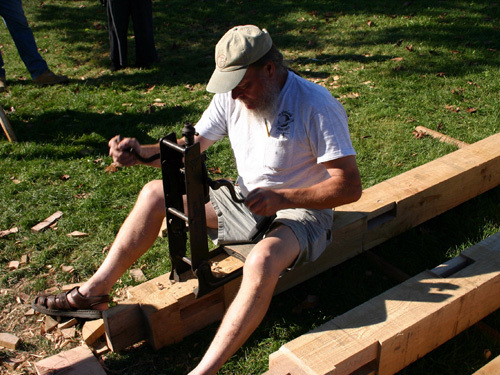 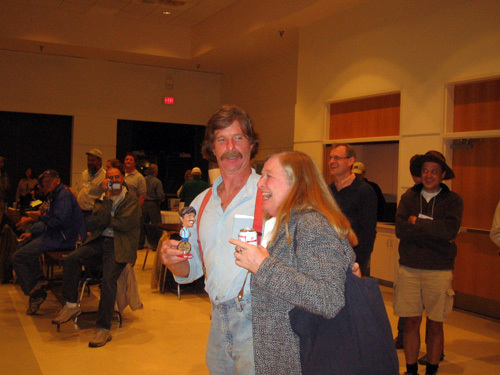 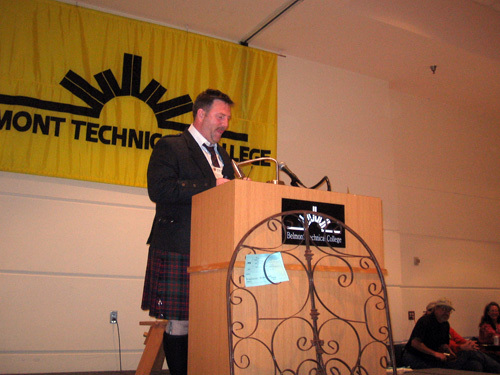 Roy Underhill, host of the popular PBS series “The Woodwright’s Shop”, opened IPTW 2005 as keynote speaker and later joined in the demonstration sessions with his box of hand tools and foot-powered lathe. 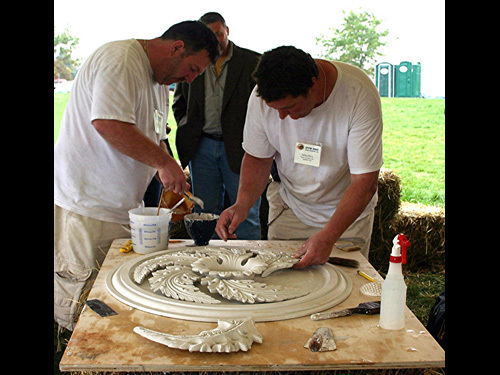 More than forty demonstrators presented sessions ranging from timber frame joinery, stone carving, window repair and brick masonry to the art of scagliola or “plaster marble”. 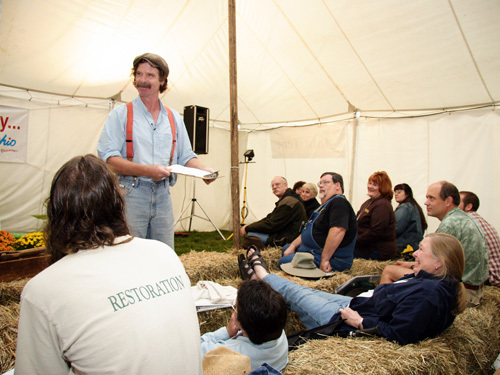 The traditional lime burn was an especially popular spot for warming up between sessions. 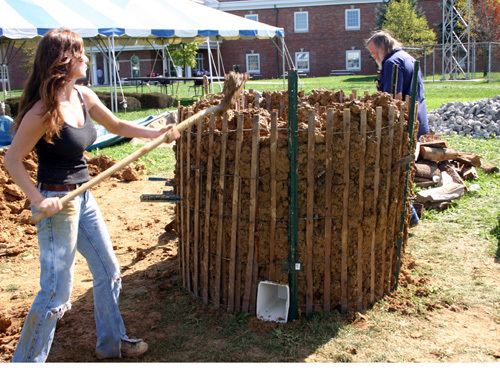 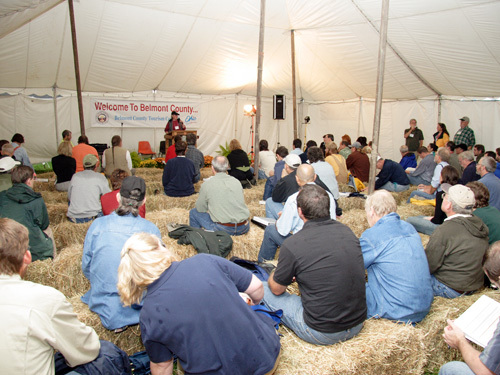 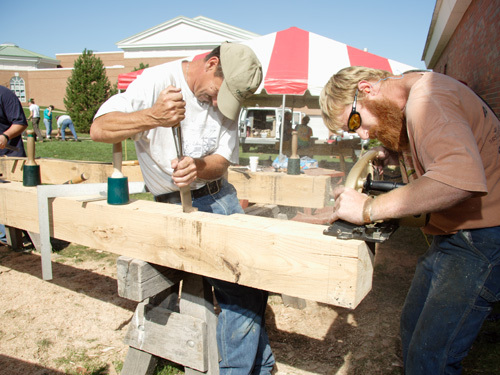 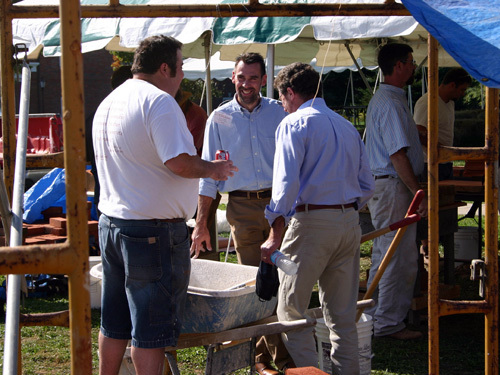 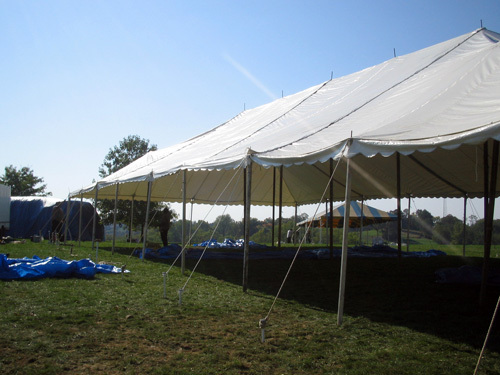 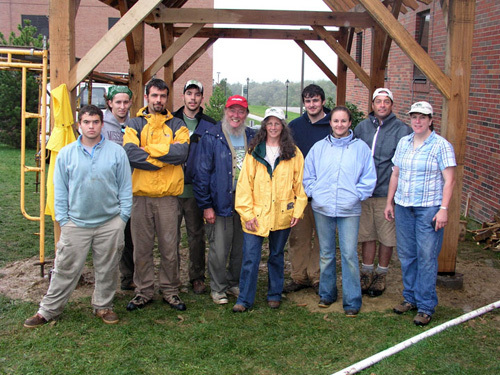 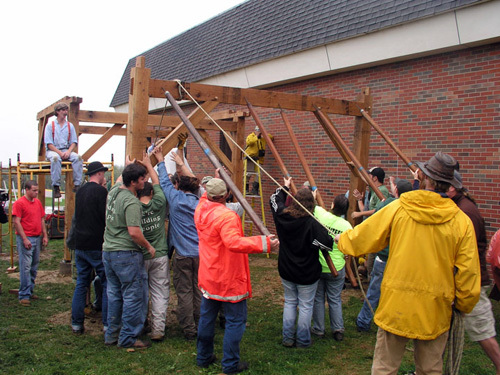 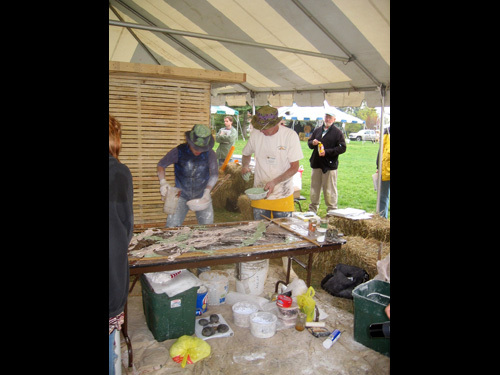 In addition to demonstrating the trades, workshop participants built permanent structures for the host institutions. 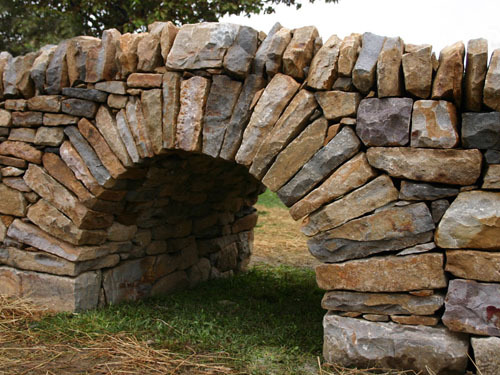 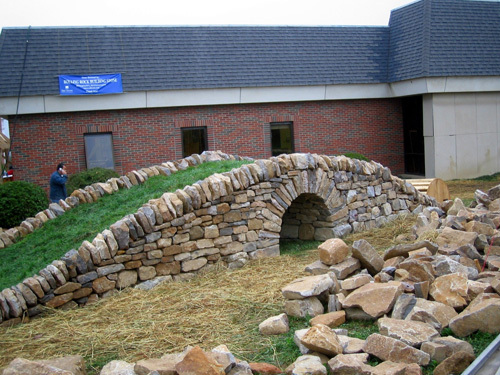 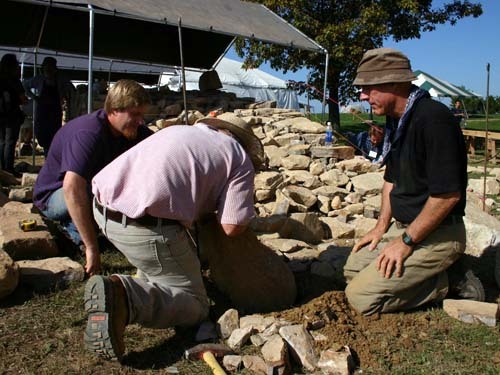 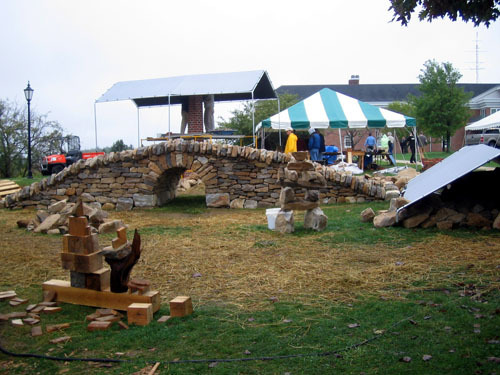 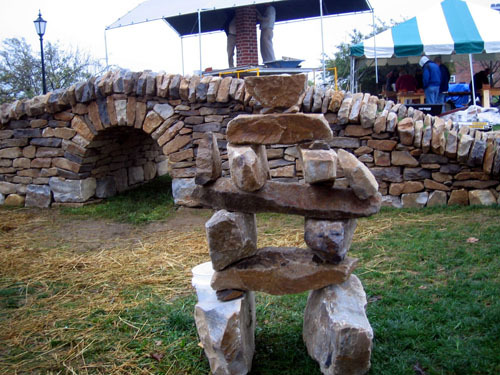 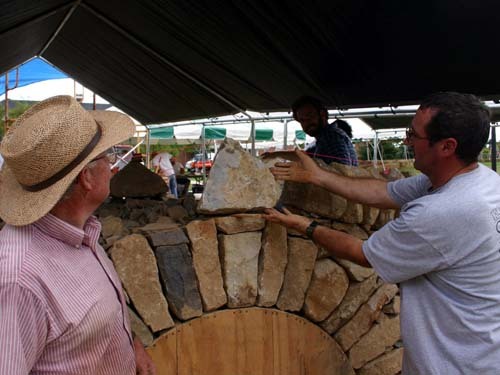 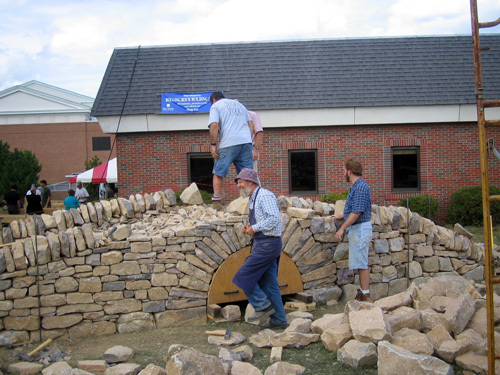 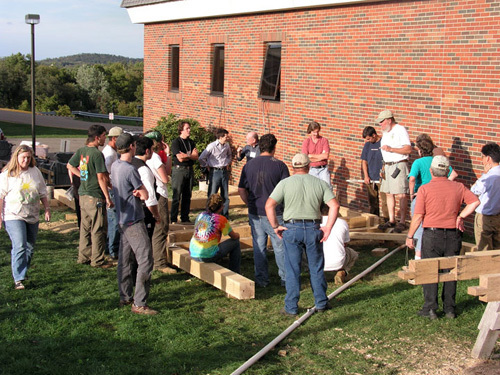 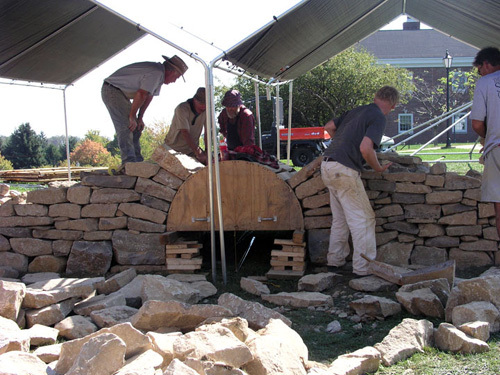 The Dry Stone Conservancy of Lexington, Kentucky organized an international group of drystone masons from Ireland, Scotland and the US to build an arched stone bridge on the campus of Ohio University Eastern with stone donated by Rolling Rock Stone of Boyertown, Pennsylvania. 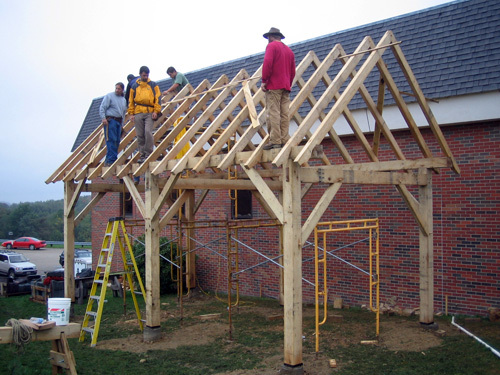 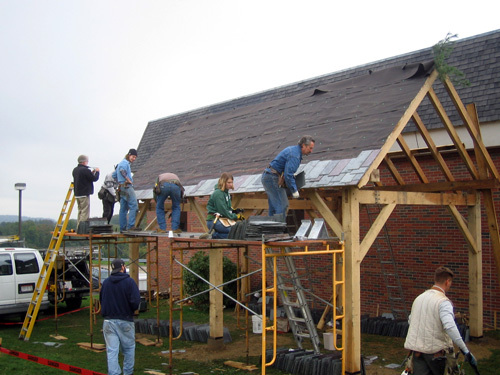 PTN, Timber Framers Guild and Slate Roofing Contractors Association members worked together to build a permanent timber framed, slate roofed structure as a traditional blacksmith’s shed with assistance from student apprentices from the American College of the Building Arts. 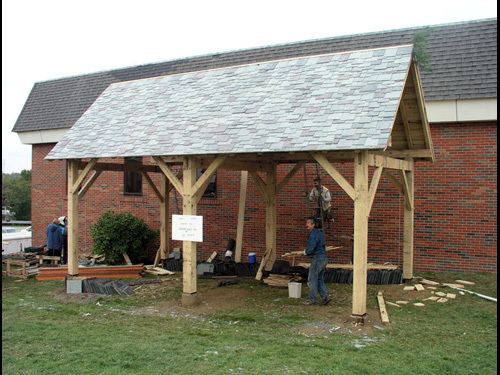 Material for the shed was donated by the Christman Company. 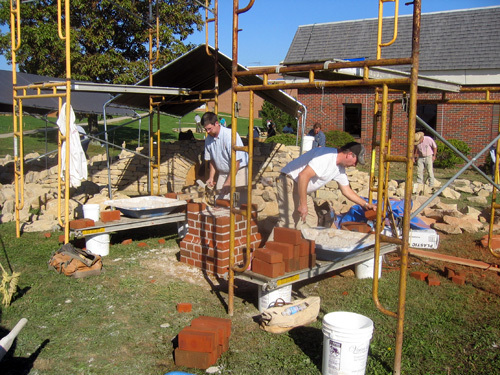 The building will be used by students in the Building Preservation and Restoration Program metal arts and blacksmithing program. 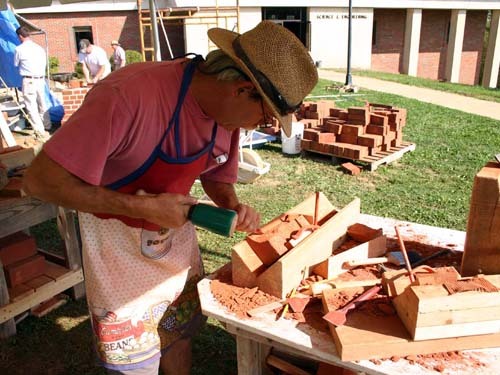 Virginia Lime Works of Madison Heights, Virginia constructed a cut and rubbed brick column demonstrating traditional methods of building with gauged brick. 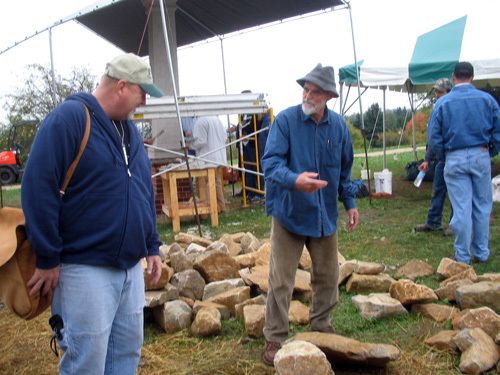 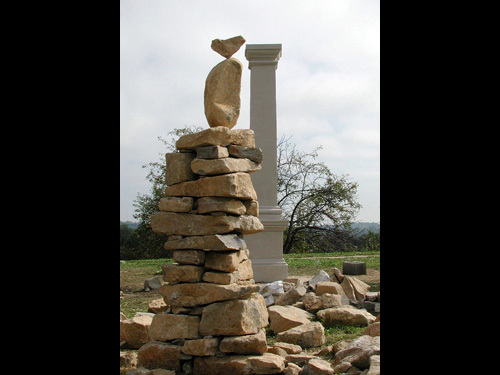 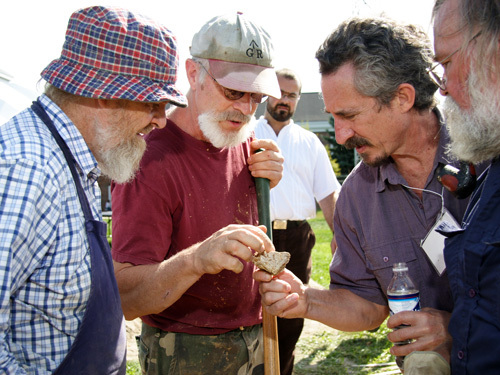 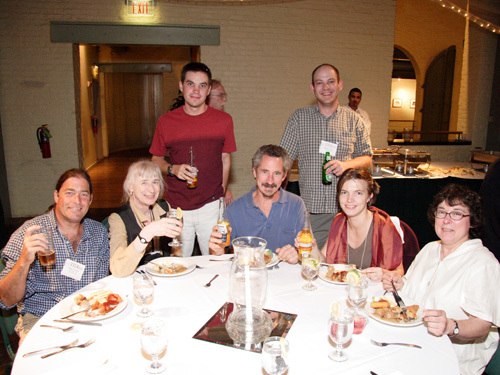 The Stone Foundation, an organization dedicated to preserving and perpetuating the time-honored art and craft of stonework held their annual Stonework Symposium in conjunction with IPTW 2005. 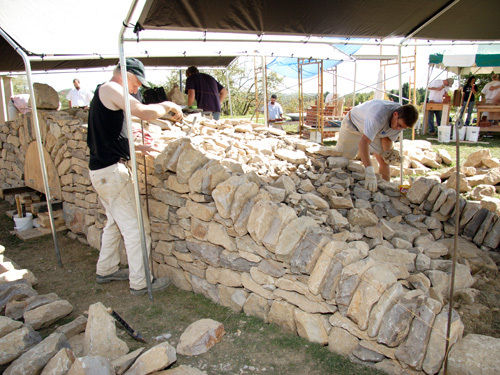 Participants in both events moved freely from scholarly presentations on the history of stonework to “hands on” demonstrations such as the session on pre-Columbian Peruvian stonework techniques by Professor Jean-Pierre Protzen, former Chair of the School of Architecture at the University of California, Berkeley. 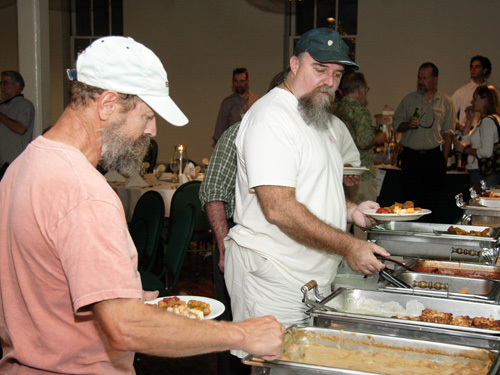 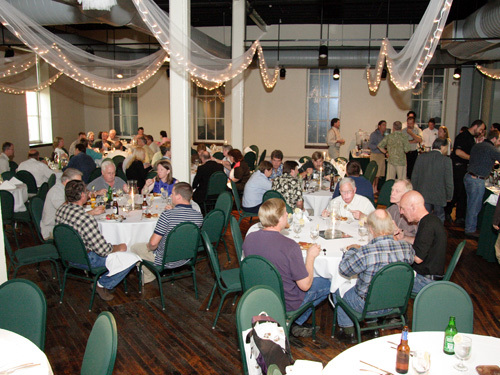 The 5th annual PTN Auction on Friday night was the most successful ever. 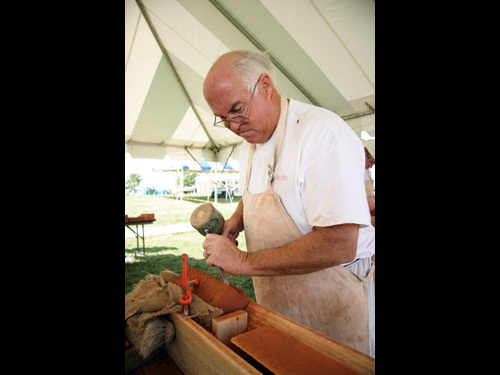 When Auctioneer Dave Acker brought down the gavel on the last bid, more than $17,200 had been raised to help support PTN. 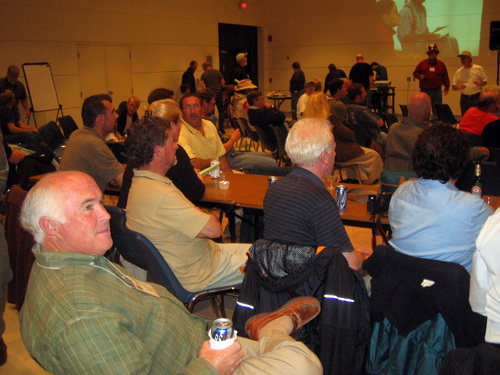 The Saturday night Barbeque and performance of the PTN All Star Band was judged by many to be the best yet. Mike Orrell, Duffy Hoffman and the other regulars were joined by Andy deGruchy for the premiere of Andy’s latest composition, “The Cover of the PTNews”. 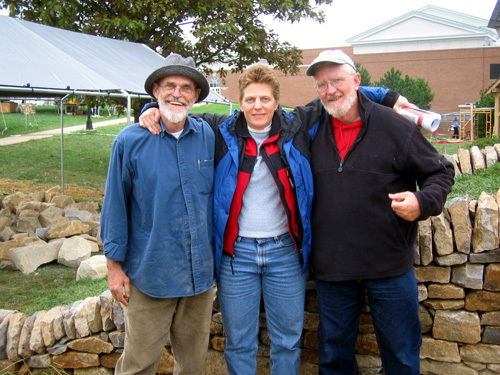 Roy Underhill sat in on harmonica and French Compagnon, Daniel Wawszczyk, demonstrated that music knows no language barriers when he picked up the bass guitar.